When one door closes, another opens. Or something like that, right? I feel the same way about the changing of the calendar from one year to the next. It’s a perfect time for starting fresh! New Year’s Day has grown to be my favorite holiday of the year. 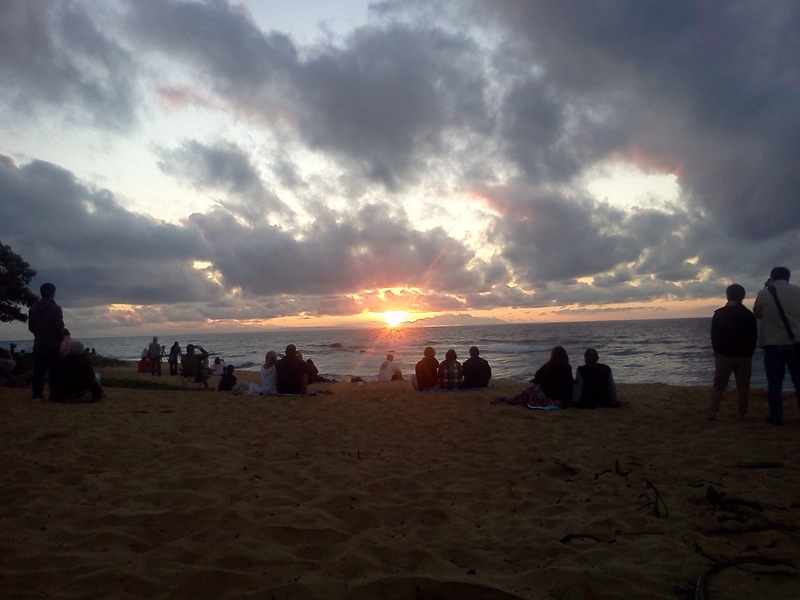 Part of the reason that I’m usually at home celebrating New Year’s Eve these days is that I truly look forward to getting up early to greet the first sunrise of the year at Sandy Beach with my friends. We’ve created a bit of a tradition and it always helps me to look back at the year that’s passing and to bring a fresh energy to the year that’s ahead. It’s grown to be such a fun and meaningful way to ring in the new year and I always love hearing when other people have joined in and found a way to participate as well, or put their own spin on ours. 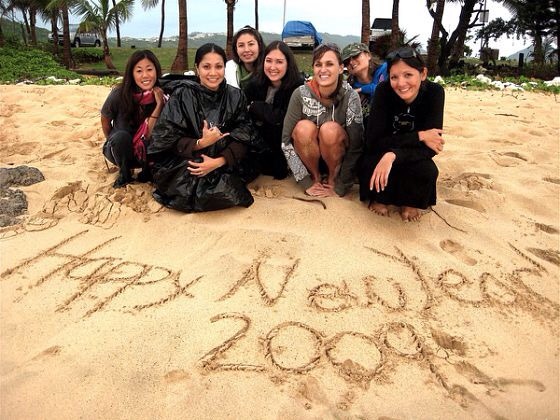 In 2008 (video above), my word was EXPLORE and it was especially meaningful getting together with my friends as on January 8th that year, Jess and I set off on our adventure through SE Asia and the Pacific. That year I traveled until I couldn’t any longer, eventually passing through 17 countries! Here are the basic components of our tradition, feel free to take them as you like and adapt to your own heart’s desire. Happy New Year! Letter to the Universe – As the year ends, we each write a “letter to the Universe” and make two copies of it. One remains sealed until you are ready to write next year’s letter (a way to look back and see what you’ve accomplished) and the other gets burned sometime after watching the first sunrise of the year. What you put in your letter is up to you – some people begin with gratitude for the year that is ending and then move on to their wishes, hopes, dreams or goals for the year ahead. Some are very specific (one of my friends writes it in past tense as gratitude for the things that will happen in the year to come!) and others are more general. It’s really up to you! Word for the Year – Each of us chooses one word (or phrase, if you prefer) to guide us for the year ahead. There are no rules here either, just that it is something that you identify strongly with and that will allow you to focus on your goals. I often write a draft of my letter to the universe, then see if anything comes up as a “theme” to help guide me towards a particular word. In the past, words that have had particular meaning for me were EXPLORE (2008, when I traveled most of the year), CREATE (2012, when I started this blog), and PASSION (2014, when I truly went after mine)… Others that didn’t seem to fit quite as well included GROW, FREEDOM, and the phrase “Expect Good Things”, which was the mantra of my friend John Kark who passed away in 2010 after battling Leukemia. First Sunrise – I think it’s been about 7 or 8 years now that we’ve kept this tradition, but my friends and I always meet on the east coast of the island bright and early before the sun comes up on the first day of the year, regardless of where we were the night before. Some have family parties that go late into the night, others are out at the clubs, others (like me) tend to fall asleep before midnight rolls around. But no matter what, we make the effort to gather at the beach with our blankets, a copy of our letter to the universe, and some bubbly to toast the sunrise as it makes its way up over the water. Hugs are shared all around and we make a little bonfire on the beach to take turns burning our letters and sending our intentions out to the universe. Everyone writes their word in the sand and we let the ocean carry it off. It may sound like a bit much, but we love it. If you don’t have a beach nearby, grab your friends or family (or take some solitary time, as I did this year) and find someplace meaningful to you. BONUS: Create a Vision Board – Another way that we turn our focus to our goals for the year ahead is to create a vision board. Most of us (again, this is all personal so do what you like!) create a board around the word that we’ve picked for the year. You can either start with something as your focus, or just dig on in to the process of going through magazines to see what images call to you. 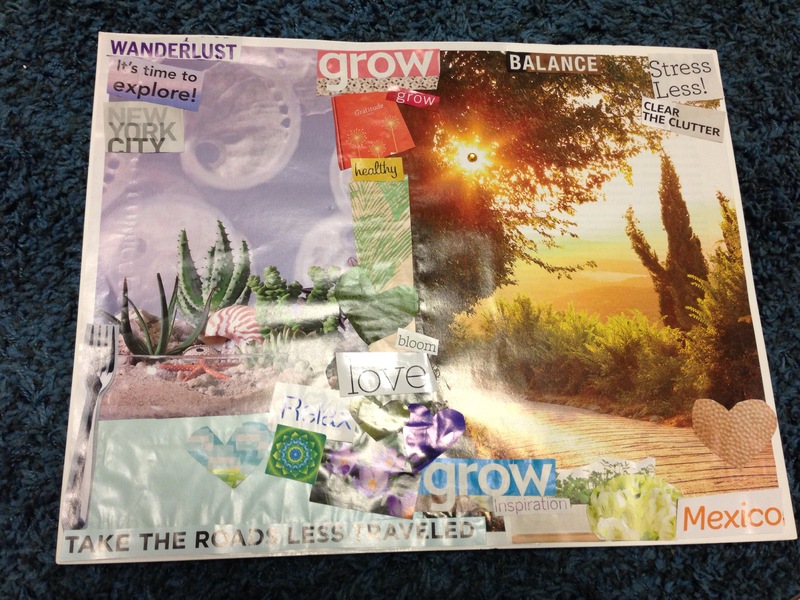 Cut out anything that inspires you – for me, sometimes it’s an image, a person’s expression, a word, or even a color – then paste them onto poster board to make your very own vision board. These can be as artistic (or completely random) as you’d like, and it’s usually a fun activity to do together, mimosas optional – plus you’ll get a better variety of magazines! I usually put mine up on my fridge or someplace where I’ll see it daily. 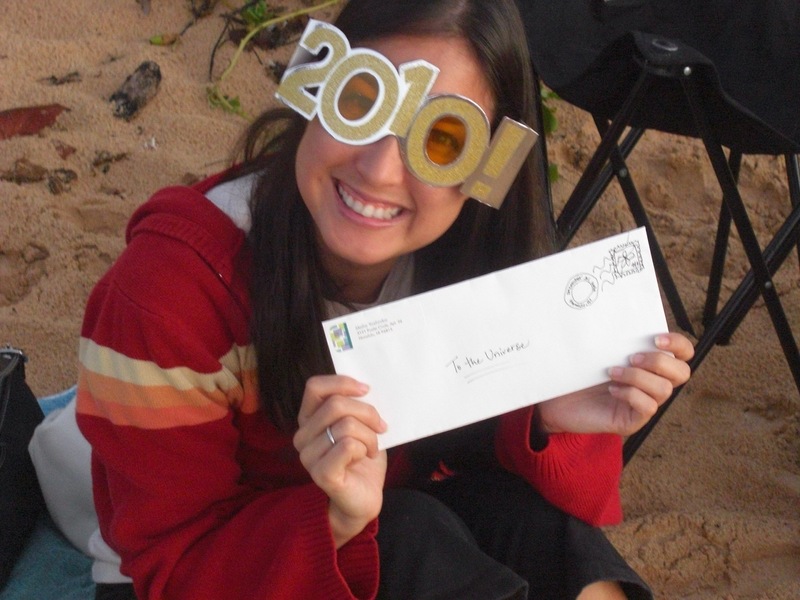 >> Have you written your letter to the universe or chosen a word for the year? I’d love to hear them – feel free to leave a comment below! >> Stay tuned for an upcoming post on my experience of New Year’s 2015, where I was alone and away from Hawaii, so I decided to greet the New Year at Machu Picchu! Yay, I made the photo cut! Here’s to passion for you and embracing for me! Oh yeah, sorry bout that! 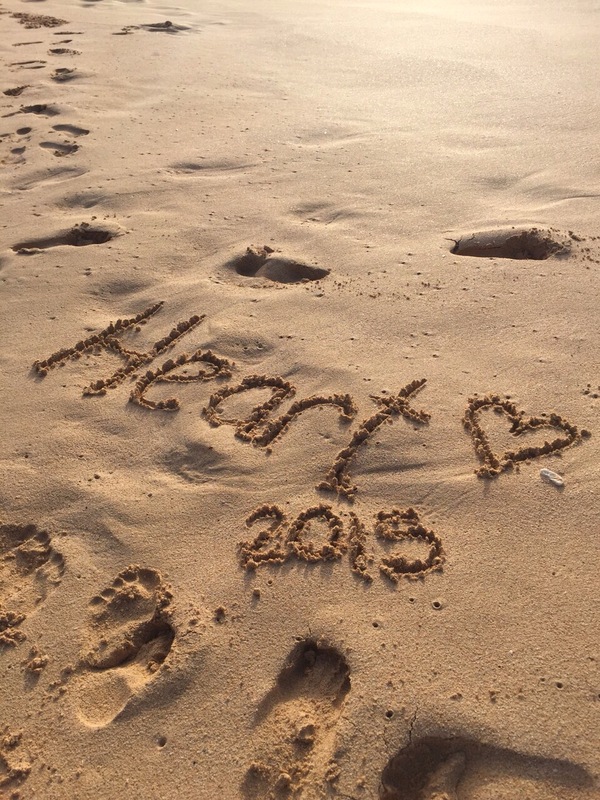 Here’s to more heart for u, because of course, the passion is always welcomed too! My Dearest Malia, I think I started this with you in 2009 or 2008? Anyway, I look forward to Letter of the Universe every year, all because of you. I even bring a new friend every year, you know how I like to ‘de-virginize’. Thank you for this family tradition. Words this year 2015…Kira: Enrichment, Ryan: Courage, Owen: Beginnings, Asher: Explore. I even did my vision board this year. Love you, and safe travels. Aww, I just love how the boys are a part of the tradition now too! I think you were there in 2008? That was right before Jess and I left and my word was Explore. Tell Asher that Aunty Malia said its a great word! !